The first triple-lens Motorola phone could be landing soon, as renders showing a Motorola handset with just such a camera setup have leaked. Shared by @OnLeaks (a fairly reliable leaker) on behalf of Pricebaba, the images, which you can see below, also show a punch-hole camera and a screen that’s apparently 6.2 inches, with a small bezel below it. The three rear cameras are supposedly all 12MP and come with a dual-LED flash, and the dimensions of the phone are said to be 160.1 x 71.2 x 9.1mm (rising to 9.7mm at the camera bump). Other details include a fingerprint scanner on the back, a USB-C port and a 3.5mm headphone port. What’s not clear right now is what phone this actually is. 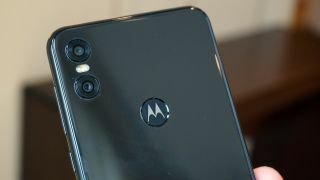 Originally @OnLeaks suggested it could be the Moto G8, but has now said it might actually be a successor to the Motorola One Power, possibly set to launch as the Motorola P40 Power. If so then it might launch alongside a sibling, as we’ve also recently heard rumors of a Motorola One Vision, a phone said to have a 48MP camera, an Exynos 9610 chipset, 3GB or 4GB of RAM and a 3,500mAh battery. Both phones – if they launch as part of the ‘One’ range – will also of course run Android One – a stripped-down version of Android that avoids manufacturer bloat. What none of these leaks tell us is when either of these phones will actually launch, but with renders in the wild we’d expect to see at least this latest leaked handset soon. We’ll let you know as soon as we hear anything else about it.